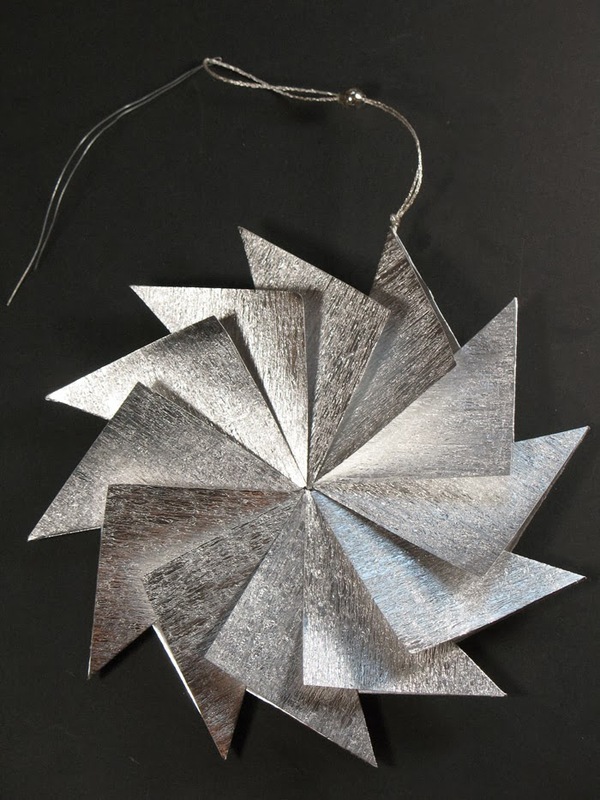 This is a simple, modern paper ornament that is easy to make and looks great on the tree. 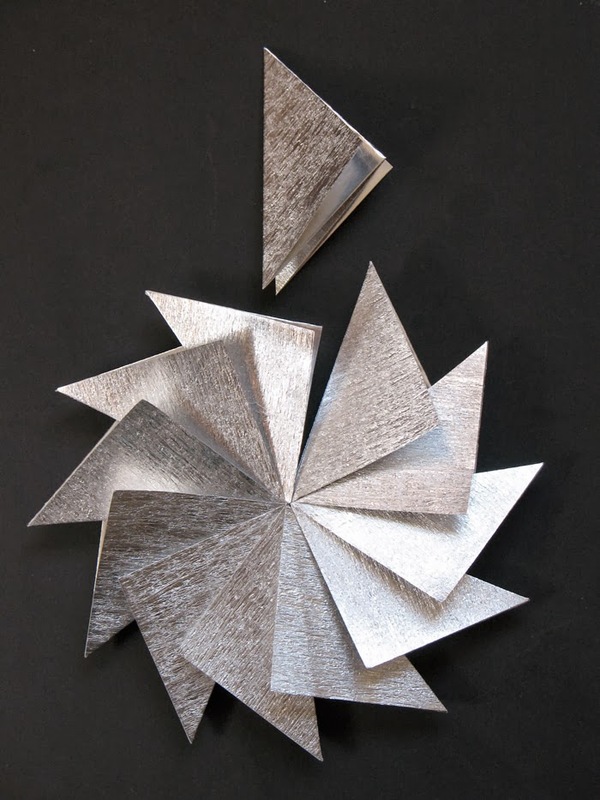 Being lightweight, it twirls when hung, reflecting light from its many angles. 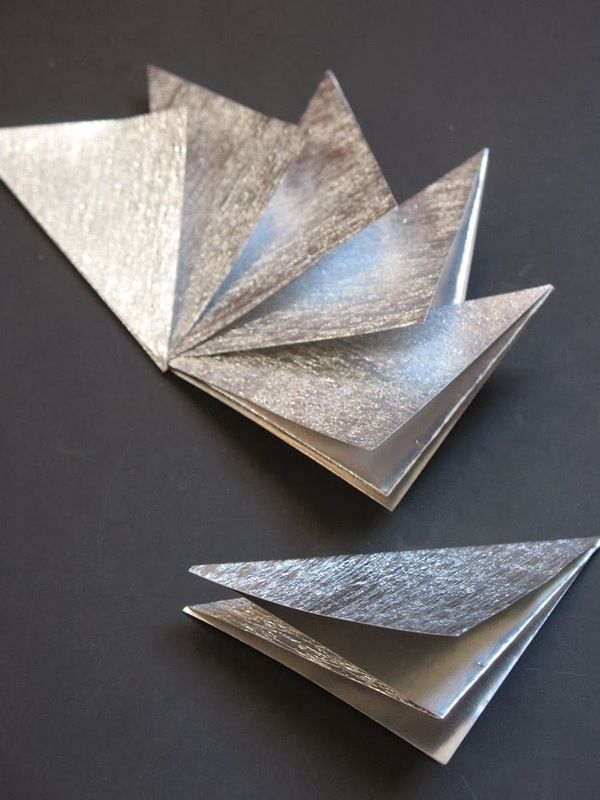 For this project, you can use almost any type of medium weight paper, either two different papers adhered together or a single sheet of card stock. 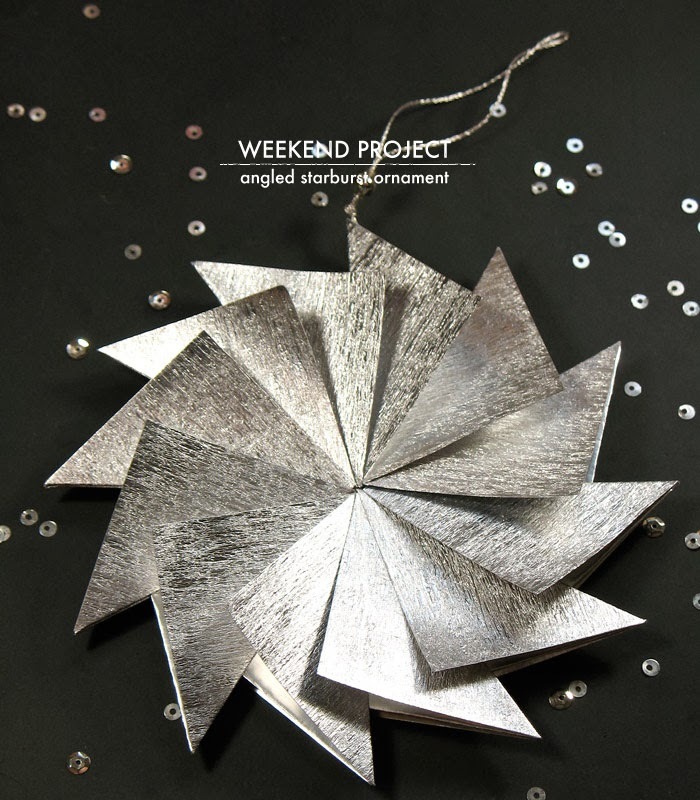 I used silver crepe paper - I like the reflective quality and texture when it’s smoothed out. I adhered it to silver paper with spray adhesive, first stretching the crepe paper out as much as I could before gluing it down and then burnishing with a bone folder. First, cut 12 pieces of your paper 2 inch x 4 inch. With each piece, fold in half, creating a 2 inch square. Fold it with the side you want to show the most facing in. Next, fold each side on a diagonal downward, lining upper edge with the folded center edge. Repeat on other side. 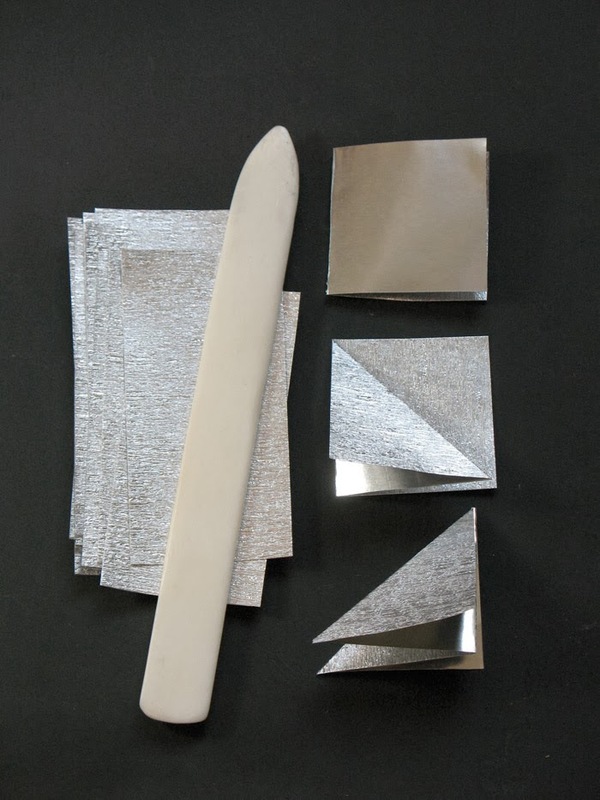 With each fold, burnish the crease with bone folder. Repeat this for each piece of paper, creating 12 double fold triangles. 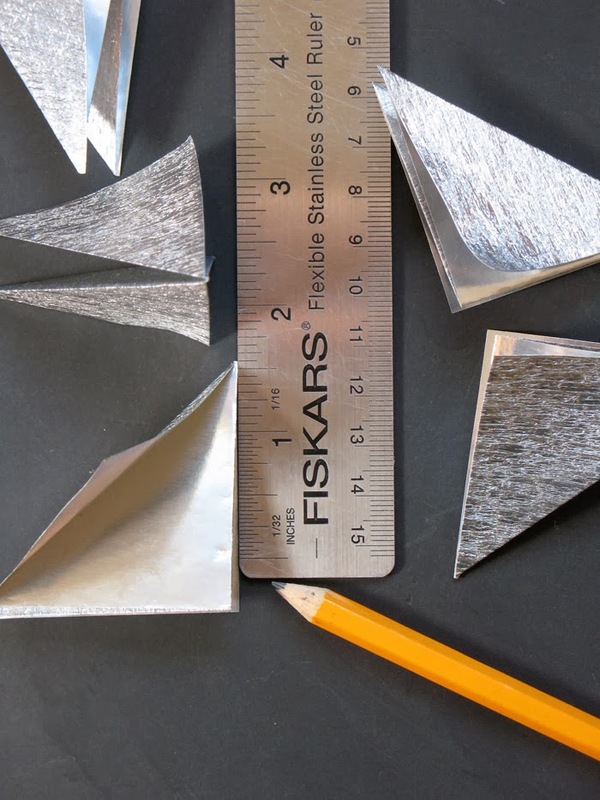 With folded edge lined up to a ruler and the top layer folded open, measure 1.5 inches from the folded tip and mark with pencil. Repeat for all triangles. Take two triangles, folded edges up and pointed to the left. Nest the left triangle inside the other, inserting the center fold between the center fold pieces of the right triangle. Keep the lower points together and line up the overlapping edge of the right triangle to just cover the pencil mark on the left triangle. Take apart, apply glue along both sides of the folded edge of the left triangle, and then assemble again, pressing firmly. Repeat this with each triangle, working clockwise. When inserting last triangle, apply glue inside the center fold of the starting triangle as well as on the folded edge of 11th triangle. Slip folded edge of last triangle inside starting triangle and overlap 11th triangle. Take 10 inch length of thread, fold in half and tie a knot 1/2 inch from end. Adhere thread to the top point of triangle, anchoring thread on both sides of the inner triangle with small pieces of transparent tape. Next, glue down triangles of paper to cover. Thread length of thin wire through thread loop and fold in half. Use wire as a needle and thread through glass bead. Anchor glass bead at the top of knot with small dot of glue. Isn't it pretty Lyndsay? I love it too!